Are you frustrated by an expensive gas or electric bill? Whether you’re looking for ways to reduce your carbon footprint or your monthly expenses, window replacement is a great option. Old, drafty windows are typically a major source of heat loss, so choosing a professional service to replace your windows can help you start saving money immediately. When you’re shopping for new windows, be sure you choose energy efficient models. Windows that are Energy Star qualified, like double-hung, double-pane windows, are a great way to seal your home from unwanted air leaks. Heat transfer through windows or cracks in the window frame aren’t just an issue in winter. Your air conditioner could be overworked as you attempt to cool a room that continues to absorb outside heat. Major air leaks are obvious and uncomfortable, but minor leaks may go undetected until you see your monthly energy bill. Another advantage of choosing energy-efficient window replacement services is an upgraded style. This is a perfect time to invest in stylish, unique windows that will improve the look of your home, both inside and out. Windows and doors are some of the only features that improve both your curb appeal and interior feel, so it’s worth investing a bit more in high quality options. There are a wide variety of frames, sizes and opening options for your replacement windows. It’s best to discuss your options with a designer to determine the ideal size and shape of windows for your home. Don’t wait for another month of costly energy bills. 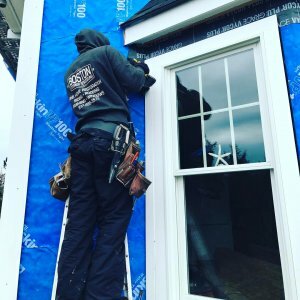 Contact a professional contractor or exterior remodeling service today to get an estimate on the cost of a window replacement. Whether you have a single trouble window or need to replace all the windows in your home, you’ll enjoy years of energy efficiency and a new, stylish look.